The Giant Magellan Telescope's third primary mirror is cast inside a spinning furnace at the University of Arizona's Steward Observatory MIrror Lab on Aug. 24, 2013. TUCSON, Ariz. — An enormous telescope that could help unlock many of the mysteries of the cosmos is really starting to come together. 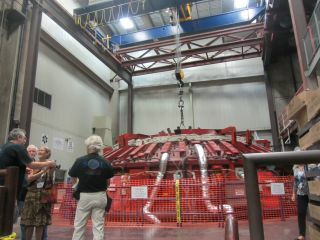 The third of the seven primary mirrors for the Giant Magellan Telescope was cast here Saturday (Aug. 24) at the University of Arizona's Steward Observatory Mirror Lab. The 20-ton mirror, which measures 27.6 feet (8.4 meters) across, was formed by melting chunks of borosilicate glass in a rotating furnace at 2,140 degrees Fahrenheit (1,170 degrees Celsius). The seven mirrors, which are all the same size, will be arranged to form one enormous light-collecting surface 80 feet (24.5 m) across, giving the Giant Magellan Telescope (GMT) 10 times the resolving power of NASA's famous Hubble Space Telescope when the new instrument begins science operations in 2020, project officials said. Astronomers will use the $700 million GMT to detect and characterize exoplanets, probe the nature of dark matter and dark energy and study how the universe's first stars and galaxies formed, among other investigations. "We're going to build this beautiful cathedral of science so that we can have truly a God-like vision of the cosmos," said University of Arizona astronomy professor Laird Close. GMT will be built at the Las Campanas Observatory, in the Atacama Desert of northern Chile. But it will perform much like a space telescope, employing seven smaller, shape-shifting secondary mirrors as an adaptive optics system that cancels out the blurring effects of Earth's atmosphere. While Saturday marked a milestone for the GMT, the third mirror is far from complete. It will stay in the furnace until November, at which point the most difficult work can begin. The surface of each GMT primary mirror must be perfect within 20 nanometers, or about the thickness of a single glass molecule. To put that in perspective: If one of these mirrors were spread out to cover the entire continental United States, GMT officials said, there could be no bump on it more than 0.5 inches (1.75 centimeters) high. Reaching this level of near-perfection requires many months of grinding, polishing, measuring and inspecting. "Big mirrors like this can take four or five years from start to finish," the Mirror Lab's Dean Ketelsen told SPACE.com. The Giant Magellan Telescope's finished first mirror and in-progress second mirror sit side-by-side at the University of Arizona's Steward Observatory MIrror Lab on Aug. 24, 2013. The GMT's first primary mirror is done; the object sits under a tarp here at the Mirror Lab, its reflective surface protected by a special blue film. Meanwhile, processing of the back side of mirror number two is under way, with front-side polishing scheduled to begin in 2015. The Steward Observatory Mirror Lab makes the biggest single-piece telescope mirrors in the world. With Saturday's casting, the facility has now made six 27.6-foot mirrors, officials said, including the two in operation at Arizona's Large Binocular Telescope and the primary mirror for the future Large Synoptic Survey Telescope, slated for first light in Chile in the early 2020s. The GMT is one of three giant ground-based optical telescopes scheduled to come online in the 2020s. The Thirty Meter Telescope, which will be built on Hawaii's Mauna Kea, will have a primary mirror about 98 feet (30 m) across, while the European Extremely Large Telescope in Chile will be the biggest telescope ever constructed at 128 feet (39 m). "I hope all three get built," said cosmologist Rocky Kolb of the University of Chicago. "They'll all do different things, and they'll all do great science." The GMT project is an international collaboration involving Astronomy Australia Ltd., The Australian National University, the Carnegie Institution for Science, Harvard University, the Korea Astronomy and Space Science Institute, the Smithsonian Institution, Texas A&M University, the University of Arizona, the University of Chicago and the University of Texas at Austin. The telescope is being funded primarily through private donations.